The 32-year old Portrush man spent the meat of this year fighting a combination of high expectations - both his own and those of the outside world - and the overpowering feeling that he somehow had to prove that his US Open win was not a fluke. No matter how many times he told himself that he was being sucked into a dangerous dynamic, he couldn’t help beating himself up when things went wrong and the resulting vicious circle put paid to his year until he finally started to “recognise” himself again in late October. Suffering a huge low after a massive high was nothing new to McDowell and he’s confident that he can once again use the experience as a positive, push on again and realise a few more dreams - dreams he once thought were impossible for an ordinary mortal like himself. McIlroy is different, however, as we all know. And McDowell believes that golf’s new Golden Child will have no problem carrying the huge burden of expectation that has been placed on his ever broadening shoulders following his recovery from Augusta agony and subsequent catharsis at Congressional. “He has been bred for this moment,” McDowell said in Dublin yesterday. “He has been a superstar for a lot of years. He has been dealing with the things I have dealt with this year since he turned pro. He’s been groomed for stardom and he will be able to handle the expectations and the pressures better than someone like myself. McDowell rose as high as fourth in the world when he returned to action in January, finishing third in both the Hyundai Tournament of Champions and the Abu Dhabi HSBC Golf Championship. Playing those events turned out to be the only thing about 2011 that McDowell would change if he got the chance to go back in time. “Looking back, if I could turn back the close 12 months and start 2011 again, not that I’d want to, I’d probably take a longer break,” said McDowell, who took a month off before the Accenture Match Play but never really succeeded in switching off and getting some mental closure on 2010. As a major champion, McDowell is judged on his performances in the Grand Slam events and his results in the big ones make painful reading this year. “I think the one stat I didn’t like the look of this year was MC-14-MC-MC and that’s my performances in the majors. That’s a stat that disappointed me more than any of the stats this year. Graeme McDowell made just one cut in the majors in 2011. 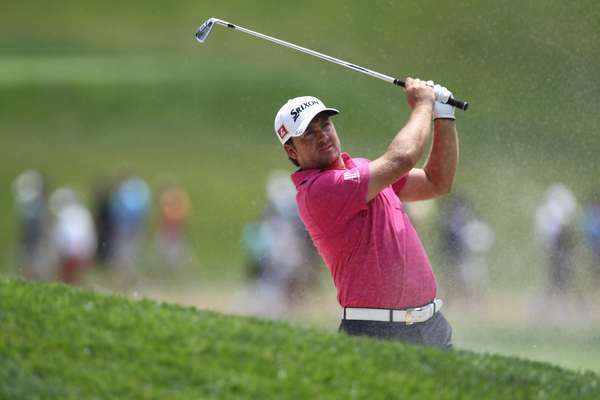 Pictured here in the third round of the US Open at Congressional CC by Fran Caffrey/www.golffile.ie“I feel like my game is suited for the majors, maybe Augusta less than the other three but I am learning the nuances of Augusta better every year. McDowell’s consistency was non-existent this year. He shot four rounds in the 80s and a closing 79 at Sawgrass, where he was leading with 10 holes to play before a bad break at the ninth signalled an unravelling that was to repeat itself at regular intervals during the rest of the year. “It’s been tough, no doubt about it. There’s been three or four events in particular – probably the last round of The Players Championship, the Saturday in Wales, Friday at the British Open, they probably will be the three lowlights of the year. The last three or four months have been great though. Great positives. I’ve probably felt more comfortable in my own skin over the last three or four months that in the first five or six months of this season. “There was a lot to deal with. I guess perceptions of me had changed. The world was looking at me differently and I could tell. My focus wasn’t where it needed to be. The last few months of 2010 I was just playing golf on this floating cloud – golf was easy, I was calm and confident and everything was flowing and carefree. “The first five or six months of this year were anything but carefree. I wanted it too much and was trying too hard and beating myself up too much. It was really good to get my attitude readjusted for the final four or five months of the season, get my technique sorted. I’d lost the plot a little bit with what I was doing on the golf course and lost control of my swing a little bit. Got that back on track and definitely felt a lot better about myself the last four or five months. McDowell felt he was going to be ready to go this year too. But knowing you’re crossing a minefield is not as easy without the map and G-Mac stood on a few mines this season, despite treading ever so carefully. “I came into 2011 promising myself I wasn’t going to be a victim of my own expectations and promised myself I wasn’t going to try and emulate 2010,” he said. “But it doesn’t matter how much you try to ignore something. It is just there. Perceptions of me had changed and it wasn’t hard for me to tell that. Things were different, things had changed and I had to try and settle and get comfortable in that environment. “Then you hit the panic button. You start trying to hard. I wasn’t trying to prove anything. It is not about proving stuff. It was more about proving to myself that 2010 was no fluke, I suppose. I didn’t have that consistency. I wasn’t myself this year on the golf course for about six months. There is no doubt about that. “The last round of The Players  was not me and Saturday in Wales  was not me. That is not the player I am. I am a lot more controlled of my emotions and my game that that and certainly I didn’t recognise the golfer. A second round 77 at the Open was the last straw for McDowell. Reflecting on the summer, he said: “When I say I hit rock bottom at the Open Championship, I was rock bottom on a new scale as far as I expect more of myself. Rock bottom now is not quite so rock bottom. If I had had the year I had this year three or four years ago, I’d probably be sitting here pretty satisfied. “So I’ve slipped from sixth in the world to 13th - what a bad year that was! It’s amazing. You realign your expectations a little bit. Expectations are very dangerous. It’s been a great year from the point of view of learning a lot about myself and a lot about how I am going forward. After missing the cut in the US PGA and then making just two of the FedEx Cup play-off events, McDowell regrouped and recovered. But there was still another blip to come. Third behind Michael Hoey in the Alfred Dunhill Links, he lost the plot again at Valderrama. Unable to find the left to right stock shot that put him in play most of the time in 2010, he spent the weekend in the cork oaks and didn’t make a single birdie in 36-holes as he carded closing rounds of 81 and 82. He threw in the towel, he said. “At Valderrama I probably stopped caring. I played the last 27 on the run - ‘Get me out of here, get me to China.’ At the Players I probably should have walked off the ninth green into the clubhouse in the last round. It is very difficult when you are so out of control to just regain that control. We have all experienced loose rounds where everything seems to go wrong. McDowell somehow snapped himself out of his daze over the last seven weeks of the season by finishing third in both the HSBC Champions and the Nedbank before claiming a fine 11th spot in the Dubai World Championship with a closing 66 on a course that does not suit his game. “I feel like I am in the place I was going into 2010 or the place I was a few weeks before the US Open. I am very comfortable with my game. I am feeling good. I hit the ball fantastic in Dubai. I finished really strong. I am happy with my game, my technique, my equipment, my focus levels, my health, my mental health. These are all big key components. I feel like my ducks are all starting to line up again when a few of them had been a bit all over the place early in the season. And I really feel I am getting things ready to the point where I can be the best player I can be. McIlroy is never far from the conversation when McDowell is around and the older man is full of admiration for the mental strength his new stablemate showed in the aftermath of Augusta. “That was impressive,” he said of McIlroy’s eight-shot US Open win at Congressional. “Very impressive. It just shows you what his attitude is like. He is quite an intelligent golfer and he has that young bounce back in him and a great attitude to the sport. That’s what you need. The difference between good players and great players is attitude and Rory has always been a great player and his attitude has always been right. McIlroy won’t be scarred by 2011 at Augusta and McDowell does not believe that believe that his ups and downs will do anything other than make him stronger. 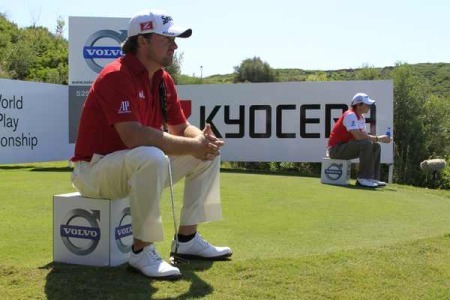 Graeme McDowell believes his lack of form could be a blessing in disguise on a course that drives him to distraction. Graeme McDowell believes can emulate Padraig Harrington and become a Major championship winner. Graeme McDowell reckons Rory McIlroy should have been handed the PGA Tour Rookie of the Year award. Wee Mac and GMac at the 2010 Ryder Cup. Picture Eoin Clarke/www.golffile.ieGraeme McDowell is backing Rory McIlroy to learn from his miserable Masters meltdown and win a wardrobe full of green jackets. Graeme McDowell hits his tee shot to the 16th on Sunday.Graeme McDowell gave Rory McIlroy a lesson in resilience when he closed with a career best 68 to turn a nightmare into a dream at the Masters.